“So what does this rediscovered film actually tell us about London?” It was an obvious question for a television journalist to ask, as the conclusion of a piece due to appear on a popular news channel, but it was also one I was dreading. Confronted with some 12 minutes of actuality film dating from 1904, how could I convey in a pithy couple of sentences the sense of ‘time regained’, the underpinning of the vibrant, bustling metropolis which this remarkable fragment revealed? What had triggered this unusual level of media interest in an archival film was an imminent public screening in Trafalgar Square, in a programme of short films chronicling London through the 20th century, as part of the 2008 London Film Festival. But the story that led to it had begun for me as long ago as 2000, when I proposed a strand in a research programme with the provisional title “The London Project”. This was intended to study in detail the growth of the London-based film industry during the period 1895-1914, undertaking new empirical research into the explosion of entrepreneurs, companies and audiences that had combined to make London one of the key centres of the new moving-picture craze – a fact long obscured by an ‘invention-centred’ historiography of early cinema. London is also a ‘site of representation’, with its population and topography providing the subject of many early films and a source of continuing fascination. It was my own work on both the early industry and on the cinematic mapping of the city that took me to Australia in November 2006, as a speaker at the Film and History Association of Australia and New Zealand conference in Melbourne. (3) Part of my visit was devoted to research in libraries in Melbourne, Sydney and Canberra on the early impact of moving pictures in Australia, revisiting the pioneering 1990s work of Chris Long. (4) As part of this research, I visited the National Film and Sound Archive (NFSA), with a request to view as much as possible of their early British, and especially London, material. And it was this request that led to me viewing footage that formed part of the Corrick Collection and was provisionally catalogued as ‘London Scenes’. The Corricks were a concert-party troupe who had toured Australia, New Zealand and South-East Asia at the turn of the century, adding film to their musical performance repertoire between 1901 and 1914. (5) So their having material that related to the old country to show audiences that would have included substantial numbers of expatriates made good sense. But it was one shot in particular that gave a clue to the identification of this material. Amid the scenes of London landmarks and street-life vignettes, there is a procession of sandwich-board men advertising “Urbanora” and “A Voyage to New York”. This could only relate to Charles Urban, the dynamic and highly entrepreneurial American producer who had done so much to promote non-fiction film after setting up his own company in London in 1903. The most directly relevant of these new explorations is Patrick Keiller’s City of the Future project, which embeds early archival film from various British cities in an interactive display, together with period maps. (10) Part of this has been included in the exhibition, Moving Pictures Come to London, which has been touring London venues since July 2006; it was displayed as an interactive installation at BFI Southbank in February 2008. Keiller writes that his project “sets out to explore contrasts between the familiarity of old city fabric, the strangeness of the past, and the newness of present-day experience”. In fact, we might say that Living London takes us back to a similar moment of intermediality a century earlier. The title, and presumably the idea, came from an illustrated part-work by George Sims, a colourful character who had blazed an even more remarkable trail through late Victorian society than Urban was currently doing in the Edwardian era. Sims (1847-1922) began his career as a journalist and popular poet before making his mark as a dramatist, with the melodramas The Lights o’ London (1881) and Romany Rye (1882), followed by many more, which toured widely. His ballads included “Christmas Day in the Workhouse” and were widely sold and quoted. 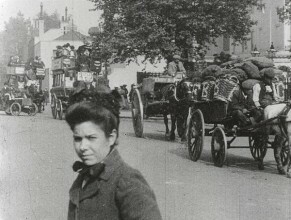 Having established himself as a specialist in London lore, he wrote about wretched living conditions in Southwark, joining the tradition of radical journalists calling for reform, which included Henry Mayhew (London Labour and London Poor, 1851) and W. T. Stead (The Maiden Tribute of Modern Babylon, 1885). Sims’ campaigning journalism appeared in book form as Horrible London (1889), before he embarked on chronicling the variety of metropolitan life in Living London, a series of volumes published between 1901-03. The format of these handsomely illustrated books was to profile a series of ‘typical’ London scenes and customs, using the new technology to reproduce photographs, making them the precursors of what would become known as photojournalism later in the century. Charles Urban had developed an ambitious catalogue of non-fiction films, which would allow exhibitors either to add these to mixed programmes increasingly built around fictional attractions, or to construct thematic non-fiction programmes. Living London represented a determined move towards offering a single film that would occupy a whole programme, albeit in four parts, but lending itself to focused promotion. Whether Sims was more closely involved than – presumably? – approving the use of his title is not yet clear. The two men may well have recognised something of themselves in the other; however, the guiding eye behind Living London is clearly Urban’s, giving the film not only a shrewd sense of what an audience would expect to see, but also a strong sense of focused composition and the brisk editing for which Urban would become noted. 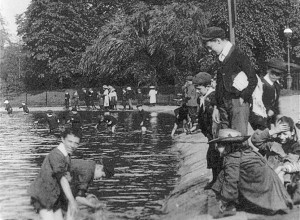 Amid the public buildings, familiar vistas and ceremonial scenes, the NFSA’s surviving fragment includes shots of an old woman huddled on a bench, children pushing a cart and bathing a dog in the Thames, and a striking image of a girl blinking, presumably due to dust in her eye from London’s notoriously dirty air – all striking images of individuality amid the city’s masses that testify to the new century’s concern with the individual in the crowd. And how should I have answered the journalist’s question? By saying that Living London showed London as the most exciting city of the new century, especially for those with personal and, in the case of Australia and other parts of the British empire, [political] links. And how seeing Living London, with the added bonus of electrical illumination, must have been almost as good as visiting it. 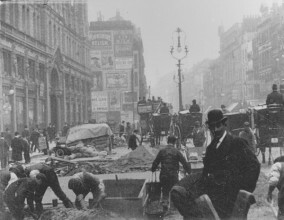 In fact, there were Australians who had visited London shortly before Living London appeared, as members of the Bushmen volunteer regiments raised to support Britain in the South African war of 1899-1903, Some of these reached the UK and wrote home about their impressions of the ‘mother country’. Some were unimpressed … others recounted how much it matched their expectations, underlining how strongly the sense of ‘belonging’ was a part of early 20th century Australian méntalité. Is it too fanciful to imagine some of those ‘Bushmen’, now back in Australia, going to see Living London, no doubt with their families? Would they have been the ones calling out that they had “been there and seen that”? In October 2008, there was a similar response among the crowd gathered in Trafalgar Square, as they identified the streets and buildings shown, many of them unchanged, including Trafalgar Square itself – an effect of temporal rather than spatial distance. 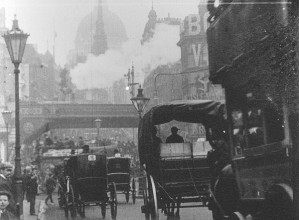 We cannot know what or how Living London communicated with its 1904-5 audiences, for whom the novelty of film was an important part of the experience, but we can perhaps learn something by analogy from how its re-mediated ‘return’ was received, initially on satellite television and then digitally projected on a giant screen in the London of 2008. Thanks due to Adrian Danks, Deb Verhoeven and Con Verevis, organisers of the XIII Biennial Conference of the Film and History Association of New Zealand, for their invitation to speak; also to Paolo Cherchi Usai, then director of the NFSA, and to his colleagues, Graham Shirley, Meg Labrum and, especially, Sally Jackson, for all their kindness to me while in Canberra, and for their subsequent help in making Living London available to screen at the LFF. Luke McKernan, “‘Only the screen was silent …’: Memories of children’s cinema-going in London before the First World War”, and Simon Brown, “Flicker Alley: Cecil Court and the emergence of the British film industry”, both in Film Studies, No. 10, Spring 2010, pp. 1-20, 21-33. In addition to the conference organizers, I am grateful to the Ian Potter Foundation for supporting me as an RMIT Visiting International Fellow. Chris Long’s series of articles on “Australia’s first films” includes much valuable work on the early impact of visiting showmen and filmmakers. See Cinema Papers, Nos. 91-4, 1993-5. On “The Marvellous Corrick Family Entertainers” and films drawn from their collection, see catalogue of the Giornate del Cinema Muto, Pordenone, 2008, p. 140. Urbanora catalogue, p. 194. By courtesy of Stephen Herbert. Urban was already a specialist in London material, having advertised such permutation as Living London Today, Living in London Today, Around London and ‘Round About London. Programme note by Leslie Anne Lewis, catalogue of Giornate del Cinema Muto, p. 148. Among burgeoning on-line resources, see for instance Film London Movie Maps, at http://www.filmlondon.org.uk/content.asp?CategoryID=820, Visit London’s Movie Maps at http://www.visitlondon.com/maps/movie_maps/ and many others. The City of the Future formed part of the AHRB Centre for British Film and Television Studies project 2001-6, which also included The London Project. Further details at http://vads.ahds.ac.uk/resources/CF.html. The City of the Future was shown as an installation at BFI Southbank in February 2008.